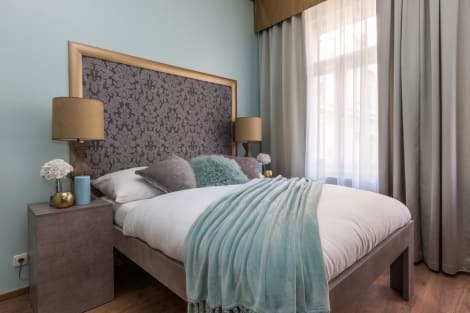 Situated in the centre of Prague in a historical building near the Pařížská street, 500 metres from the Old Town Square, the Pragueaparts Old town E offers accommodation with free WiFi 1 km from the Charles Bridge. The apartments feature an equipped kitchenette, a dining area, a satellite TV and a bathroom with a shower. A shared washing machine is available to guests. The area abounds in restaurants of various cuisines within a 5-minute walk and there is a grocery shop 300 metres from the apartment. The Prague Castle lies 3 km from the property and the Wenceslas Square is 1 km away. The Staroměstská Metro Station is reachable in 4 minutes on foot and the Florenc Bus Station is 1.5 km away. The Main Train Station is 1.8 km from the apartment. Guests are required to show a photo identification and credit card upon check-in. Please note that all Special Requests are subject to availability and additional charges may apply. This property will not accommodate hen, stag or similar parties. A damage deposit of EUR 200 is required on arrival. This will be collected by credit card. You should be reimbursed within 7 days of check-out. Your deposit will be refunded in full via credit card, subject to an inspection of the property. Please note that the property has no reception. Please contact the property at least 1 hour before your arrival to arrange check-in. Contact details are stated in the booking confirmation. Arrivals and departures outside official check-in/out times will be charged with EUR 25. Please note that the property`s exchange rate can be different to the one provided by your bank. If paying by a credit card, it will be charged in CZK. Differences are not refundable. With a stay at Prague Central Exclusive Apartments in Prague (Prague 1), you'll be within a 5-minute walk of Old Town Square and Old Jewish Cemetery. This 4-star apartment is 0.3 mi (0.5 km) from Astronomical Clock and 0.6 mi (1 km) from Charles Bridge. With a stay at Gorgeous Prague Rooms in Prague (Prague 1), you'll be within a 5-minute walk of Old Town Square and Astronomical Clock. This 4-star aparthotel is 0.6 mi (0.9 km) from Charles Bridge and 0.7 mi (1.2 km) from Wenceslas Square. Take time to pamper yourself with a visit to the full-service spa. If you're looking for recreational opportunities, you'll find a sauna and a fitness center. This apartment also features complimentary wireless Internet access, concierge services, and babysitting/childcare (surcharge). Featured amenities include complimentary wired Internet access, a business center, and limo/town car service. Planning an event in Prague? This hotel has 431 square feet (40 square meters) of space consisting of conference space and a meeting room. Guests may use a train station pick-up service for a surcharge, and self parking (subject to charges) is available onsite. Relax and unwind with massages and body treatments. This Art Deco hotel also features complimentary wireless Internet access, concierge services, and babysitting/childcare (surcharge). Guests can catch a ride to nearby destinations on the area shuttle (surcharge).